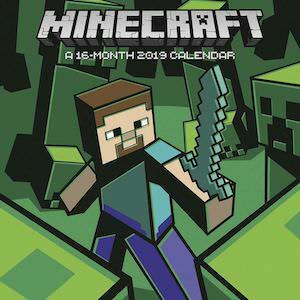 Now there is a 2019 Minecraft Wall Calendar that is a must have for all the players of Minecraft. Each month will bring you a new image based on your favorite video game. The images are made of 4 colors which gives it a cool classic look and is blocky like Minecraft. Below the big image of Minecraft there you find a calendar grid that has a background that reminds you of many block pallets. On the calendar grid you find the major holidays filled out while leaving you lots of room to fill out important appointments and birthdays. So stop looking for you new calendar because you can get this 2019 Minecraft Wall Calendar. We all have the need to figure out when things are happening and that is why this 2018 calendar mousepad is so handy to have at your desk at home or the office. The white mousepad shows just the calendar of 2018 on it so now you can see easily when your birthday is and on what day Christmas is. Your new mousepad has a nonslip back and is great for your mouse as it is smooth and clean. Sure this mousepad is only useful in 2018 but then next year you can go with something else maybe a 2019 calendar mousepad. 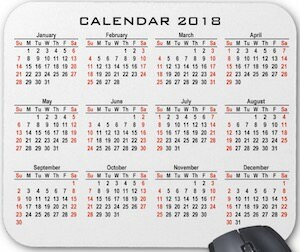 Get ready for 2018 with this 2018 calendar mousepad. So you got an iPad mini and are looking at a way to protect it that is also functional. If you work a lot with dates then this case could be so handy. The iPad mini case is black and comes in a matt or glossy version and has a 2013 calendar printed on the back so do you need to know at what day Christmas is this year? just turn over your iPad and see on the calendar. It’s super handy and it makes your iPad look a bit more personal. The iPad mini case is made from hard plastic that keeps you iPad safe from harm while allowing access to all the ports and buttons, it even works with Apple’s Smartcover. 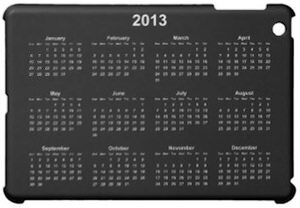 Come and check out this Black 2013 Calendar iPad mini Case. Why get a wall calendar when you are always on the go? Now we found the perfect calendar for you. A sticker robot calendar, each month another robot that you can stick where ever you want. Maybe on your phone, laptop, book or you car. And the robot calendars are easy to move without leaving any glue. 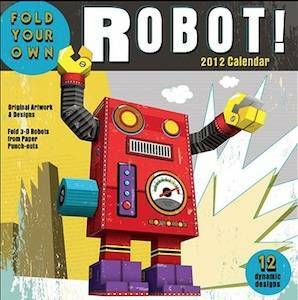 So if you like robots and need a calendar then come get this Robot Sticker Calendars 2013. You can’t play Angry Birds all the time not even with the latest Angry Birds Space. And for those moments that you are not playing the Angry Birds game they made a calendar. This is a 2013 wall calendar for Angry Birds Space and that means all the characters and all the planets ready to entertain you while you are not playing the game. This Angry Birds calendar offers 16 months of Angry Birds fun and that means that it all starts NOW. 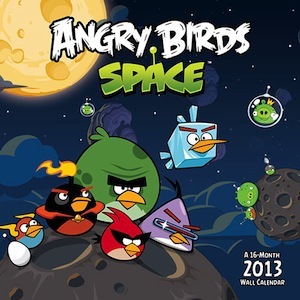 Come order you Angry Birds Space Wall Calendar 2013. Lots of our visitors love robots and 2012 can become you robot year. 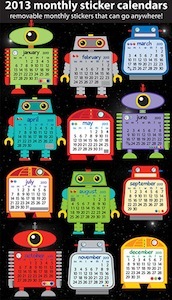 This 2012 robot wall calendar is more then just a pretty robot calendar. This calendar also includes 12 easy to build robots. The designs are in the back of the calendar and are ready for you to punch out and build. And then of course you have 12 brand new 3D robots. If you are or know are robot nut then 2012 can’t get a much better start. Go order you 2012 Robot Calendar. I am using my iPhone now for 2.5 years and at this point in time I am still using my iPhone 3G. But by using your phone as your personal assistant your run in to it’s limitations. For instance how do you do your todo list. OK there are tons off apps for that but making it work between my mac, iPad and iPhone is not that easy or not that cheap. Eventually I ended up using task manager in gmail witch you can make talk to lots off apps. When I started the idea of this post I was pretty unhappy with the default calendar Apple gives me. I hated it that I could not change the calendar(group) after I finished my post. And I was pretty unhappy that if on a day I only had an appointment at night i would not see it till I scrolled down. For me those two things really bugged me and that made me decide to figure out what options I had. The funny thing that in the time between then and now Apple magically seemed to have fixed those things for me and I don’t have a clue when and as far as I know it didn’t happen in an operating system upgrade. Before I start talking about the Calendars I will tell you that these opinions are based on MY experience and that could mean that you completely disagree. Also I will only talk about the iPhone version although the iPad editions are some nice piece of software but I did not use them enough to give an opinion. The first 3e party calendar I tried was CalenGoo witch made alot of sense to me because of the integration with Google Calendars witch I use for some of my Calendars that I share with others. 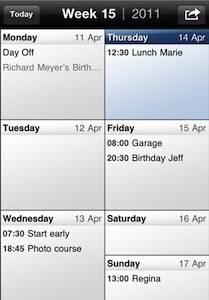 At first glance CalenGoo is a great calendar that offers some real nice features like the landscape week calendar and also the week calendar in portrait. CalenGoo offers a great calendar that works like you want but it also has some flaws that made me stop using it. first off all and for me the main reason the way it switches between portrait and landscape is slow really slow and it you activate it real easy. As far as I know you can’t lock it in one position but have said that CalenGoo offers a huge amount off settings in witch I completely go lost. A small thing I also did not enjoy much was that when you enter a new appointment the title field jumps to an empty screen to fill out your title and then you jump back to your calendar. Nothing serious you think but at a curtain point it just annoyed me. I really liked the big button to manually sync specially as I don’t have a data plan I was in control. The task manager was good and easy to reach. But the final verdict is that this app is slow and basically to slow on an iPhone 3G to have fun using it specially the switching between landscape and portrait takes way to long. Check out the CalenGoo Website for more information. Easy Calendar is not the full feature calendar like the others in this review. The base is a week view calendar that shows you your complete week. No day or month or even list view are available. But have said that the simplicity makes it kind of easy to use. Easy Calendar just shows you this week and you can select your appointments or add some. The strange thing is then that you get a limited input screen that has the basic options but nothing more. For instance if you want to put your appointment in a group then you have to press the more button witch then brings you to the Apple calendars input screen and yes this works but it feels strange. Then there is the calendar overview witch does not offer you any colors or something like that to see the difference between calendar groups and that makes it a bit annoying to use. But if you like a simple calendar that shows you your whole week then this is probably the best option for you. I really enjoyed it but my main reason to stop using it is was that it takes way to long to start on my phone it takes almost 15 seconds to get the app to the point i can use it and that does not work for me. 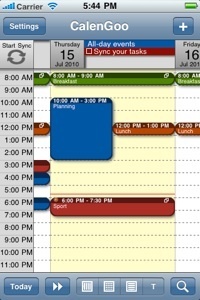 Easy Calendar also misses a task manager so if you want that it’s not build in. Check out the Easy Calendar Website. First let me tell you that Calendars has an amazing look iPad app witch loos great but I really did not end up using but it is included with the iPhone app so if you buy one you get both. 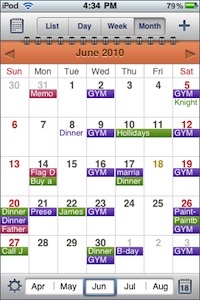 Calendars has the most use full view of all the apps tested although some colors from groups really don’t come out well (you may have to change them) the calendars are real easy to see. The list view was my favourite . And this was the first calendar that puts your tasks in the calendar (if they have a due date) On the other hand the task manager is a real pain to get to I don’t know why but the button they made (right bottom) is almost impossible to press even if you change from landscape to portrait it stays the same. You have keep pressing and then if you are lucky eventually it will work. So for me the task manager that talks to Google was not used. Calendars seemed to have spend a lot of time to get there interface working the way you like (besides the task manager button) and so doing editing or adding new events is easy. One thing really annoyed me so much that I also stopped using this calendar and that is it makes duplicates of calendar entries and it does that randomly and that is something that really didn’t work for me. Besides that Calendars is the calendar to keep an eye on. I will keep watching for updates to see if they solve the Task manager and the duplicates and then I would definitely give it a try again. Check out the Calendars website for more information. 3. In case “Local Calendars” are set on, then turn off the “Google Calendars” not to duplicate events in Calendars applications. If you still can see some events duplicating, turn off Local Calendars toggle too. So after all this I am back using the build in calendar app that Apple gave me and for tasks I use GoTasks and now I am happy as Apple change the things I hated. But have said that I have to say that when Calendars get it’s problems fixed I would definitely try them again. Also Easy Calendar stays on my list of apps that I keep checking and for now only CalenGoo is the one that moves from my phone.